Markus Lüpertz, now an honorary doctor and rector of Düsseldorf’s Art Academy, is of the most dazzling artists on the German scene. As a "new wild man" of the 1960s he made his name with expressive, representational painting. The "painting king's" interests extend from set design to poetry and prose writing to playing improv jazz on the piano. His large sculptures, contended since 1980, have instigated major controversy in various European cities. Thematically, Lüpertz is captivated primarily by European history and Greek mythology and its symbolism; he only briefly touches on the abstract. Today he counts among the world’s most important exponents of neo-expressionism. 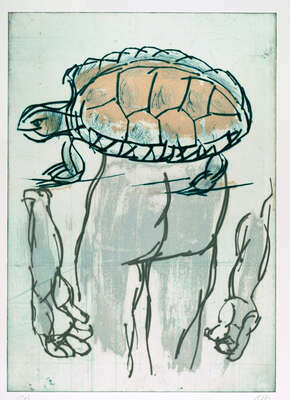 - The turtle is a symbol of the underworld but also of fertility, domesticity, chastity, and patience. - "Dressed elegantly the modern dandy (Lüpertz) strolls across the boulevard of the contemporary press as his predecessor did over the Champs-Elysées. Some of his eccentric forerunners were led through the Paris arcades by a turtle. But what the slow turtle was to the classic dandy is now the self-bred attack dog to Lüpertz, whose colors have been bred to match his suit. The means of self-representation have sharpened in the truest sense of the word." 1970 Villa Romana Prize for a one-year residence in Florence, Italy, began the "German Motifs"
1984 Residence in New York, creation of the pictures "Pierrot Lunaire"
1986 Professor at the Düsseldorf Art Academy, Rector since 1988, creation of the "Interspace-Ghost Series"
1993 Creation of the first pictures in the series "Men without Women – Parsifal"